As you’re dreaming about adding a deck to your home and planning how to make it a reality, you should consider composite decking for your decking material. Spring has finally sprung in this area, so you may be spending more time enjoying the beauty of nature and the outdoors. This is even more comfortable when you have a beautiful and comfortable deck to relax on. Perhaps you’re also thinking about the upcoming summer and dreaming of cooking out on a deck and relaxing in the summer sun. As you’re dreaming about adding a deck to your home and planning how to make it a reality, you should consider composite decking for your decking material. A composite deck will provide season after season of beauty, comfort, and other benefits. Composite decking is the green choice, so if you’re worried about your environmental impact, it is a decision you can feel good about. Most types of composite decking are made from recycled materials, like used plastic milk jugs, plastic bags, and leftover sawdust. Most of this stuff would otherwise go into landfills. By choosing composite decking, you’re keeping it out of the landfill and in production and use, to the tune of 30 lbs of garbage for every 20 feet of composite deck. Composite decking does tend to be more expensive than traditional decking, but for many people, this cost is balanced by the decreased cost and time that needs to be devoted to maintenance. A composite deck requires very little maintenance. When it starts to get dirty, all you need is a soft bristled brush and some soapy water to scrub it up with. This deck requires little more work than your kitchen floor. Wood decks, on the other hand, while less expensive to build, require intense maintenance every other year, like bleaching, staining, and sometimes even sanding to maintain their appearance and safety. If you haven’t looked into composite decks since they were released in the ‘90s, you may be surprised by all of the options available. Composite decking comes in a wide variety of colors, making it easy to achieve the perfect look to match your home, yard, and vision. 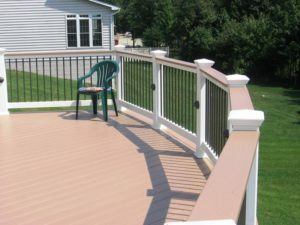 And since this color is manufactured into the product, you don’t have to worry about painting the deck to achieve your desired color or about re-painting because of peeling or chipping paint.